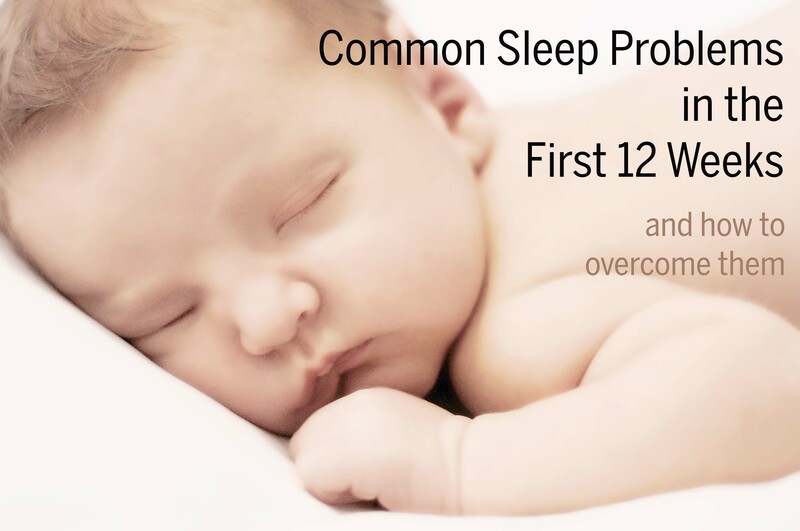 There are common sleep problems that appear again and again in babies under 12 weeks old. Here are the ones that we encounter most often. If you were rocked to sleep in my mother’s nice warm womb for 9 months you would prefer to go to sleep having a cuddle too. Who wants to lie in a cold, hard and lonely cot? Sleep habits are learned, and learning to go to sleep in a cot rather than in mom or dad’s arms is another lesson your baby is going to have to learn. It won’t happen overnight, and it doesn’t need to be a harsh process. Of course, if you prefer to rock your baby to sleep, then this is totally up to you, and this is your own personal parenting choice and there is nothing wrong with it. Your child will eventually have to learn how to fall asleep on their own and the timing is up to you. Start gently by placing your baby in their cot just after they have drifted off to sleep, but keep a tight hold of them for a few minutes after you have put them down so they still have the feeling of being secure. It can help immensely if you swaddle. Gradually start putting your baby down a little sooner, with the ultimate goal being putting them in their cot very sleepy, but still awake. There is nothing wrong with holding them or having a firm hand on their chest so they feel your touch and your presence while they drop off to sleep. 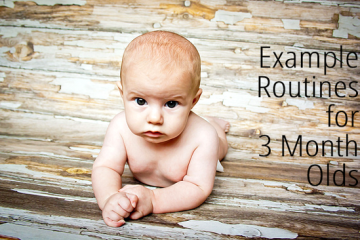 If your baby is still in the newborn phase they might be startling themselves awake at the 10 or 2o minute mark, so you might need to stay with them to help them through these transitions. Almost all newborns will go through a phase where they get their days and nights mixed up, this is a really common sleep problem. This normally resolves itself by the time they are 6 weeks old and you don’t need to do anything to help them switch over, it just happens. While it is tiring, if you are able to sleep during the day when your baby sleeps then you will have more energy to attend to them when they are awake at night. If your baby is older than 6 weeks, was not born prematurely and still tends to spend more time awake than at night than during the day then it might be worth intervening a little and assisting them to get their days and nights sorted. The best way to to do this is to help them stay awake for longer during the day and have shorter naps. I would recommend looking at the awake time chart to see how long your baby should be staying awake between naps. Aim for this gradually if you can, increasing their awake time in intervals until they are meeting the awake time recommended in the high sleep needs column. The second thing you can do is make sure they don’t go longer than 4 hours between feeds during the day time. This will probably mean waking them from a nap in order to feed. Babies who have long stretches between feeds during the day will need to make up for their missing calories sometime, and this means waking up during the night because they are hungry. 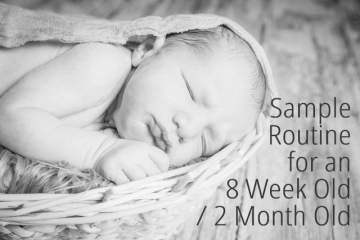 Unless your 8-12 week old is waking ever one to two hours I would not be concerned (it is normal for babies less than 8 weeks old to wake every few hours for a feed). Waking up hungry in the middle of the night isn’t a sleep problem. It is 100% normal! You might have people telling you that your baby should be sleeping through the night by now, or you have a friend with a baby who sleeps for a full 12 hours, but there is nothing wrong with your baby. Even the average 5 month old is only sleeping for just over 6 hours straight at night. Infact, most babies who start sleeping for 12 hours straight from a young age back flip at around the 4-5 month mark and start waking up multiple times per night. Use the following graph to see how much night sleep the average baby gets and read about sleeping through the night here. Slow and steady wins the race, and your baby WILL sleep through eventually. Read the full article and solutions for waking at the 10 minute mark here. Read our article about 45 minute naps here. I highly recommend having a look at the book The Wonder Weeks, it will give you some really good insights into your baby’s behavior and strategies for overcoming sleeping and feeding issues, and fussiness. Also, The Baby Whisperer by Tracy Hogg and Healthy Sleep Habits, Happy Child are also fantastic reads (most are available on Kindle so you can get reading and have some solutions and strategies under your belt straight away! ).